We know more patients than ever are covered by health insurance. We know emerging technologies, consumer demand and economic pressures are shifting healthcare into new models — models that will engage patients and put them back at the center of care. 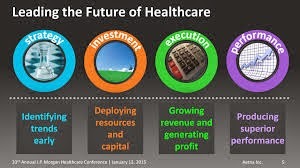 But how much will these forces noticeably change the healthcare landscape this year? PricewaterhouseCoopers' (PwC) Health Research Institute surveyed 1,000 U.S. adults, experts and clients to find out. They took a pulse on the top health industry issues for the coming year and presented their findings in a webinar last Thursday. Here are the top 10 issues of 2015. 1. Do-it-yourself healthcare. This year, the intersection of consumer desire and technological advancements will put "D.I.Y. healthcare" at the top of the agenda, PwC predicts. Increasingly, consumers are taking charge of more of their own care. Technology companies are ready to help this happen with the development of apps and mobile devices to track health metrics such as vital signs, medication adherence or even urinalysis. Nearly half of physician respondents said they would be comfortable using data from a mobile device to determine if a patient should be seen in person or prescribed medication, and 90 percent felt the apps and mobile devices would be important to their practice in the next five years, according to PwC's HRI. 2. Making the leap from mobile app to medical device. The mhealth app space is getting more and more crowded. The FDA will likely review more mhealth apps this year than ever before. Regulatory approval could give some apps a competitive edge in a crowded sector. The rush of new apps also means consumers will need a way to sort through all the available tools. 3. Balancing privacy and convenience. Approximately five million patients had their personal records compromised from data breaches last summer alone, Mr. Isgur says. These EHRs, which offer personal, medical, financial and insurance information, can go for up to $1,300 on the black market. Yet as healthcare organizations strive to make data private, they must also consider their consumer, who could benefit from convenient data access. The healthcare industry can learn a lot from the financial and retail sectors on how to balance convenience and privacy with data. Collaborations with experts across industries may help healthcare organizations develop better security strategies. 4. High-cost patients spark cost-saving innovations. There is a very, very small percentage of people that cost our health system a lot of money. The sickest 1 percent of patients generates 20 percent of U.S. healthcare spending and dual eligibles are especially costly. We also know there's a laser focus in most healthcare organizations to try to reduce costs. To do that, many organizations are trying to look at those populations and develop innovative care models. This year we will likely see health systems employ a variety of strategies, including delivering care in new settings, through telehealth and retail clinics, high-tech solutions like wearables and apps, and low-tech solutions like making sure diabetic patients have refrigerators to store their insulin. 5. Justifying the price of specialty medications. Increasing stress on the healthcare system is leading many insurers and healthcare systems to control drug costs by limiting access to high-priced, specialty medications. Though cost has been an issue for many years, expect insurers to raise the bar in 2015 for both patients and providers to access to these medications. From the patient perspective, we've seen an increase in financial responsibility that continues year over year, and frankly is not changing. It's getting more significant as insurers move to coinsurance and larger copayments, looking for the patient to have more of a contribution to the cost of their drugs, more of a conscious decision about the need for the drug. Patients will increasingly be a factor in decision making for drugs. Correspondingly, from the physician perspective, [insurers are] really looking for physicians to present a much more detailed, clinical profile of the patient to justify medical necessity, and in some cases, that's extending all the way to the request for genomic data. 6. Open everything to everyone. There is a shift beyond making data transparent solely for the sake of remaining compliant. Instead, manufacturers, regulatory agencies and prescribers are transforming the way data is shared with a greater sense of collaboration. For instance, pharmaceutical and medical device manufacturers are contributing clinical trial data sets to Project Data Sphere, The Yale University Open Data Access Project and other programs. A great deal of clinical data is never published based on the outcomes of different trials, initiatives or registries. This movement to publish sort of the good and the bad and make things more transparent, I think, is clearly a top issue for this year. 7. Getting to know the newly insured. More than 10 million adults have gained health coverage through the Patient Protection and Affordable Care Act, according to PwC's presentation. The insurance industry and provider community are trying to learn about this group in a short period of time. Additionally, primary care physicians, surgeons and other specialists have seen measurable increases in the proportion of Medicaid patients in expansion states, according to PwC. Hospitals and health systems in the states that have expanded Medicaid are seeing significantly different types of revenue figures, which are evidence of an increase in admissions and a reduction in uncompensated care debt. As far as implications, it makes sense for providers to contract broadly with insurers and help uninsured and underinsured enroll in coverage, she says. 8. Physician extenders see an expanded role in patient care. Extenders — such as nurses, physician assistants, pharmacists and others — will have an expanded role in patient care. Over the next five years, the supply of primary care nurse practitioners and physician assistants is expected to increase by 30 percent and 58 percent respectively. States will have to again visit and revisit their scope of practice laws. One implication of this trend is that extenders initially may not slow growth in the cost of care as much as people think due to the demand for extenders, resulting in an increase in the cost of wages. However, that is expected to level out. 9. Redefining health and well-being for millennials. As baby boomers retire, employers, insurers and health systems are looking for new ways to engage, attract and retain millennials. Employers will have to really pivot to better meet the expectations of this group of millennials. It will require them to reorient strategies from the concept of wellness to one of well-being. By 2030, millennials will make up 75 percent of the U.S. workforce, according to the PwC. 10. Partner to win. In this new hyper-competitive environment, people are thinking differently about how they collaborate and with whom they collaborate. According to the PwC, successful companies that want to thrive "will work together on innovative products and services." An analysis of the Fortune 50 healthcare companies found that about 40 percent pursued new healthcare partnerships last year. It's no longer enough to partner at a peripheral level…You really have to think critically about who you partner with.